It is silent. The only thing you can hear are the birds tweeting. Seven or eight fishermen, immigrant Iraqis and Syrians, are squinting under the sun. Judging from their clothes, they must have just recently arrived. It is half past 10 on a Sunday. My nieces and I have gone down to Maren, the bay at the heart of the town, to feed the birds. We don’t even have time to crumble the bread before doves, ducks and seagulls gather around us. About 20 ducks decide to walk up the stairs when they realise the little girls can’t throw far. The fishermen are looking at us slightly annoyed; they think we are scaring away the fish that would usually bite. 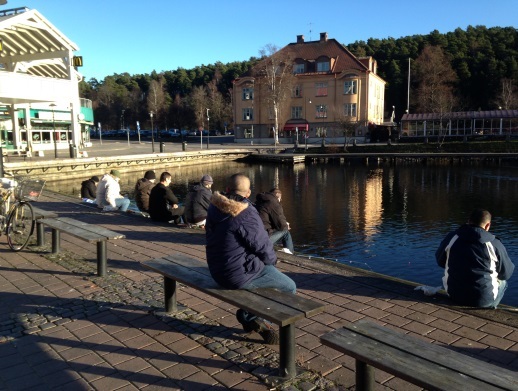 Around 20 other non-Swedish men show up; three of them take photographs of the birds and of us. They work for Scania, the Swedish truckmaker, in Argentina and are here for a visit to the head office. “You have a beautiful city,” one of them tells me while he zooms in on us and the birds. When we are out of bread and the Argentineans have walked away to the next tourist attraction, everything turns silent again. My nieces, four- and two-years-old, have sat down next to the fishermen. Someone is sobbing. Behind us, a young man in his twenties takes out his mobile, looks at it, cries, then puts it back in his pocket. He tries to suffocate the tears, takes up his mobile again, looks at it and cries. He repeats this motion several times. I sneak away from the girls and the fishermen, and I ask, in Swedish, if he needs any help. He doesn’t understand what I am saying. He speaks Arabic (thank you Södertälje, for making us multilingual!). I repeat my question in his tongue. He doesn’t even look at me at first, but then he slowly raises his eyes. “Do you know anything about the meeting at St. Jacob today?” he asks me. The church has asked refugees from Syria to attend a meeting. The meeting is to discuss their future in the small Swedish town. The church also wants to know if they are in need of housing, food, clothes or other things. The young man, named Gabi, a Christian, has defected from Bashar al-Assad’s army in southwest Syria. It took him five months to get to Sweden. Another heart-breaking refugee story, too long to write down here. For three months he has been staying in a rented, two-bedroom flat with three other young refugees from Syria. But now the landlord’s relatives have arrived – also from Syria – and he is forcing the men out of the flat. Today, Gabi has also learned that his best friend has been found dead outside his house in Syria’s capital. It is the friend’s picture he keeps looking at on his mobile. And now here he sits, the one rescued from the war, the one who succeeded in getting himself to Sweden, with nowhere to stay, no work and no more of the money he brought from Syria. Most of it went to pay the smugglers. He had to pay $18,000, about 118,000 Swedish Krona, to get to Södertälje. Everyone who comes here has to pay those sums. Everyone. I give him a phone number; the person who will answer might be able to find him a new roof to put over his head. We get up from Maren. The town is moving, the stores are open now and many families are out shopping; white families, ethnic Swedish families, the kind we don’t see on weekdays. At this hour, most Assyrians and other immigrants are at church. “Uncle, uncle, look, they are hitting each other.” The four-year-old brings my attention to a fight. Two men in their thirties are fighting in the middle of a road crossing, kicking each other. One of them starts bleeding from the nose. The fight ends when the cars almost drive over them. A woman pulls on the jacket of one of the men. Things calm down and we move on. We sit down at Tidermans, my favourite coffee shop. The girls are really happy about their sweets and soft drinks. I look at them and feel glad. They don’t live in Södertälje. They don’t have to be a part of the war in Syria. Almost everyone I know here has relatives who are still in the country or have fled to a neighbouring country or are on the way to Sweden via another country, which is the easier smuggling route. Everyone knows someone who has been threatened, kidnapped, raped or killed. We are a part of the war, whether we like it or not. Another reason I’m happy for the girls is that they don’t have to hear adults speak about gangster wars and corruption involving our people. And more than anything, that they get to meet ethnic Swedes. They get to integrate, as it is so harshly called. But then my joy changes to something else, a feeling of defeat, of giving up, of betrayal. Södertälje has its charm, and it’s easy to romanticise about multiculturalism, but sometimes that can be foolish. To say we don’t have problems in our town is to lie. To try describing the town from a Swedish viewpoint is wrong. Sure, this is Sweden, but it isn’t Swedish. It is a different culture, a mixture of completely different cultures. And the most important thing has been achieved: to educate the newly arrived refugees about how Swedish bureaucracy, Swedish laws and regulations work. Or at least the most essential ones. They walk around not knowing what is right or wrong. And they look at some of the ethnic Swedes as overlords, as a state and a power, something that in Iraq and Syria was seen as the enemy. I am generalising, but then, I’m allowed: I was brought up here. I left Södertälje 23 years ago, but am back, to a totally new, exciting city. Exciting, interesting, mad, with abuse and despair, crime and murder. But also love. We fight through gritted teeth, we fight for our relatives’ survival in other countries far away, and we fight for a healthy environment in our Swedish hometown. When the girls and I leave Tidermans, one of the fishermen stops me. He caught a fish and he wants to tell me about it. He has been in Sweden for two years. I ask him if he knows anyone who is Swedish; I make a joke about the ethnic Swedes having the best fish recipes. “Yes, the welfare-lady, she pays me my benefits every month. Do you think she’ll give me a recipe?” He laughs. He is right, I had forgotten. A friend told me the same thing a week ago. The toilets at the welfare office in Södertälje, at Nygatan, have been shut for almost six months. Nuri Kino is an independent investigative reporter, filmmaker, author, Middle East & human rights analyst. This article was translated from Swedish by Izla Rhawi.